Note: The Profit & Loss Statement is a summary that calculates on a cash basis to quickly view a snapshot of your business' cash flow. It is not intended to be used in replacement of the recommended year-end tax reports. To access from the Shortcuts form, click Profit & Loss Statement (or from the Business Tools menu, select Profit & Loss). Enter a date range to view applicable information and if desired, click Print to print. 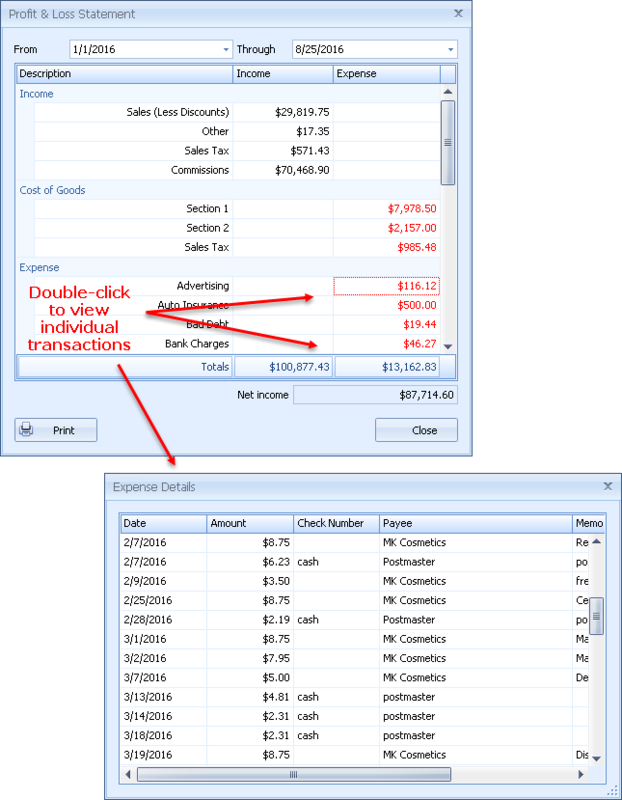 To view the individual transactions for a specific category, double-click on the figure (or right click and select Drill Down). To print a listing of individual transactions from a specific category, we recommend printing the Detailed Expense Listing by Category which can be accessed from Reports located under the Business Tools menu.